Jack Galmitz was born in N.Y.C. in 1951. He now resides in Elmhurst, N.Y. He began writing haiku in 1999. Intermittently, some of his poems have been chosen to appear in the annual anthologies published by Red Moon Press, and he was selected as one of the featured poets for A New Resonance 4: Emerging Voices in English-Language Haiku (Red Moon Press, 2005). In 2006, he was awarded the Ginyu Prize (chosen as the most accomplished books of haiku by the World Haiku Association) for his first two collections, A New Hand and Driftwood. He has sparsely written critiques of some haiku collections – the works of Tateo Fukutomi and the collection of Ban’ya Natsuishi’s poems in A Future Waterfall. In 2010, he was awarded the Kusamakura Grand Prize in the foreign language category. He received a Runner-up award in the newly-inaugurated Vladimir Devidé Haiku Awards (2011). Two of his haiku received a Zatuei (Haiku of Merit) Award in the Vanguard category (World Haiku Review, December 2011). He has recently been named “contributing editor” at Roadrunner Haiku Journal. He has been honored to have been chosen to be an Associate of The Haiku Foundation, created by Jim Kacian. Books Published: A New Hand (Wasteland Press, 2006); Driftwood (Wasteland Press, 2007); For a Sparrow: Haiku [Translations into Macedonian by Igor Isakovski] (Skopje, Macedonia: Blesok, 2007, in Macedonian and English]; Balanced is the Rose (Wasteland Press, 2008); The Effects of Light (AHA Online Books, 2002); Of All the Things (Ascent Aspirations Publishing); Sky Theatre (Ink: Literary E-Zine); A Simple Circle & Rockdove (Traveling Forms: Japanese/English Haiku); and The Coincidence of Stars [ed., Chris Gordon] (ant ant ant ant ant, 2011). 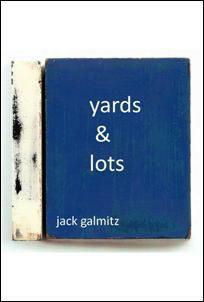 yards & lots is an uncommonly imaginative haiku presentation (a sophisticated weaving of the traditional and the iconoclastic) that takes the reader on a New York City stroll with the feel of an overcast Sunday: poignant moments and the effects of tragedy, and pauses to observe the yards and lots representative of urban living. Simply superlative; literary art to the ninth power! Cover art by Chris Gordon.